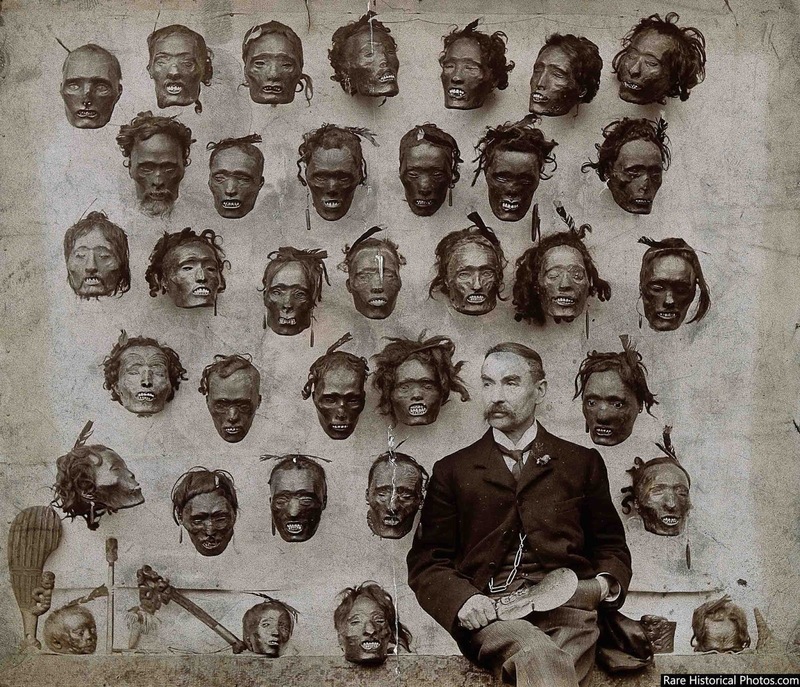 Major General Horatio Gordon Robley with his collection of Mokomokai tattooed heads. Major-General Horatio Gordon Robley was a British army officer and artist who served in New Zealand during the New Zealand land wars in the 1860s. He was interested in ethnology and fascinated by the art of tattooing as well as being a talented illustrator. He wrote the book Maori Tattooing which was published in 1896. 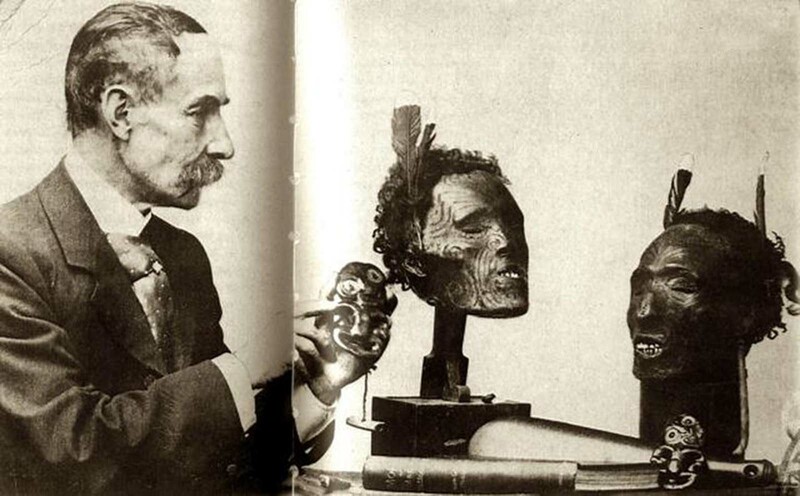 After he returned to England he built up a notable collection of 35 mokomokai (Maori tattooed heads). In 1908 he offered them to the New Zealand Government for £1,000; his offer, however, was refused. Later, with the exception of five heads, the collection was purchased by the Natural History Museum, New York, for £1,250. When someone with moko died, often the head would be preserved. The brain and eyes were removed, with all orifices sealed with flax fibre and gum. The head was then boiled or steamed in an oven before being smoked over an open fire and dried in the sun for several days. It was then treated with shark oil. Such preserved heads, called mokomokai, would be kept by their families in ornately-carved boxes and brought out only for sacred ceremonies. In the early 19th century, with the arrival of Europeans in New Zealand, tribes in contact with European sailors, traders and settlers had access to firearms, giving them a military advantage over their neighbors. This gave rise to the Musket Wars, when other tribes became desperate to acquire firearms too, if only to defend themselves. It was during this period of social destabilization that mokomokai became commercial trade items that could be sold as curios, artworks and as museum specimens which fetched high prices in Europe and America, and which could be bartered for firearms and ammunition. The demand for firearms was such that tribes carried out raids on their neighbors to acquire more heads to trade for them. They also tattooed slaves and prisoners (though with meaningless motifs rather than genuine moko) in order to provide heads to order. The peak years of the trade in mokomokai were from 1820 to 1831 (after that the demand for firearms diminished because of market saturation). I mean no disrespect to Maori customs, but it's pretty grisly for me to comprehend. Why is it grisly? Many cultures preserve body parts as relics, etc. I'd have thought a non native collecting the heads is the weird part..
Hmm... what's grisly to me is the collecting of these heads as curios or artwork, and using firearms and ammunition to trade for these heads. That's where I see the disregard for human life. When you think about history, try and think about it from the perspective of that date in time and not about where you are in time. In that place in history, these were normal customs for this tribe. After the firearms were introduced, think about the desperation to protect oneself and your family . The tribes people probably didn't have much of value but to the European people those heads were an oddity. The Europeans had guns and they probably traded because they wanted the oddity to collect just like this man here. We see it as grisly because we wouldn't dream of doing that in today's society. But for this tribe that was their norm. .....and this is the multiculturulism that globalism ties to shove down our throats. My father died last month and we honored his wishes for his corpse to be embalmed and displayed for a while before being buried in a yard with hundreds of other preserved bodies. The difference between leaving those bodies undisturbed and everyone digging them up for trade is a just a little economic incentive and governmental instability. The culture that seems questionable to me in this article is the one that would accept human remains as payment for goods. I wonder if he masturbated over them. He looks the type. Kim has an excellent point and she is absolutely correct. Our modern era is way to judgmental, then what makes those opinions even less connected is basing assumptions on today's beliefs and values. Yes, it was a different time back then. Completely different people who if they could have looked into the future, would probably be horrified to see our customs which are perceived as normal by the modern mainstream. In fact, there are many living now, who see these "customs" that are presently lived under, as not to be something desired. Most critics seem unable to stay relevant in those past lifestyles. it isnt weird but is unsettling to see even a picture of a wall full of heads mounted for display. of course all sorts of civilizations have practiced saving and revering bodies and parts of bodys in the ossuaries of just a couple /few centuries ago back to the romans in the catacombs. what the maori did was not so much different at all. they developed a great way to preserve a more 'lifelike' countenance than other cultures have. some had no inclination to preserve skin and features just the bones were good enough. i have to agree that the weirdest part is trade in the heads or bones. same as with all those bone chips and pieces of the original cross that soon to be named saints throughout the centuries all across europe. no means for establishing provenance then either. crazy what people do, isnt it? i love to read about it however and probably would stare for hours at one of these heads should i ever encounter one, face to face.